It was only last December when we analyzed the pollution spike from the Thomas Fire, one of the largest wildfires in California’s history. Now, only half a year later, California and other states are combatting large wildfires once again. California is in the middle of yet another record-breaking fire season with more than 11 severe blazes burning a combined 820,000 acres. This is already more than twice the area burned just last year, with no end in sight. Due to dry conditions and record high temperatures, California is facing increasingly destructive wildfire seasons. The ongoing Mendocino Complex Fire, which is even larger than the record breaking Thomas Fire, has already burned across 302,086 acres. The unprecedented severity of this fire in combination with the Carr Fire (176,069 acres burned so far) in Shasta and Trinity Counties, the Ferguson Fire (95,000 acres acres burned so far), and more in Southern California will have a devastating impact on the communities and the environment in these areas. But, with the unparalleled size and spread of these fires, another equally dangerous risk threatens California: smoke. Which begs the question; how will these fires affect the air we breathe for the weeks to come? There is no doubt these various fires are creating hazardous air pollution conditions in the surrounding regions, but we needed a way to quantitatively assess this. Therefore, we would like to highlight our high quality global air pollution data set that provides a five day air quality forecast, currently available in the Planet OS Datahub. This data uses a comprehensive global monitoring and forecasting system to estimate the state of the atmosphere on a daily basis. It combines information from models and observations in order to provide a daily 5-day global surface forecast. The Planet OS Datahub provides 28 different variables from the CAMS AirQuality Forecast dataset. In light of these fires and our available datasets, Planet OS Data Integration Engineer, Eneli Toodu assessed the PM2.5 levels in the United States, and also in Los Angeles and San Francisco. For a tutorial on how to do this, the GitHub notebook is also available here. Often included in air quality reports from environmental authorities and companies, PM2.5 refers to atmospheric particulate matter (PM) that have a diameter of less than 2.5 micrometers. A product of combustion, these fine particles tend to stay in the air longer than heavier particles, thus increasing the chances of inhalation by humans and animals. These minute particles can penetrate the lungs and circulatory system, often causing adverse health effects. As we can see from the visual above, the PM2.5 levels will spike to ‘very high’ levels in California, Idaho, Washington, and Oregon — the states most significantly impacted by the current wave of wildfires. 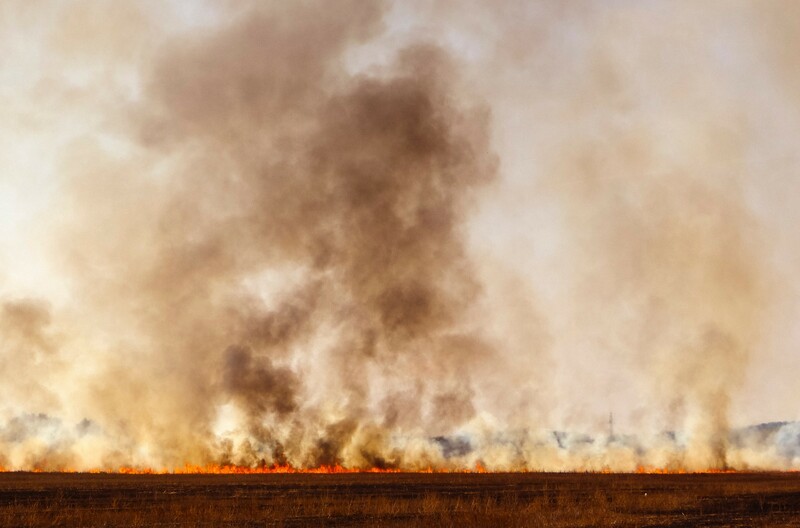 As these wildfires burn their surroundings, they emit large amounts of carbon dioxide, black carbon, brown carbon, and ozone precursors into the atmosphere. Wildfires also emit substantial amounts of volatile and semi-volatile organic materials and nitrogen oxides that form the particulate matter. 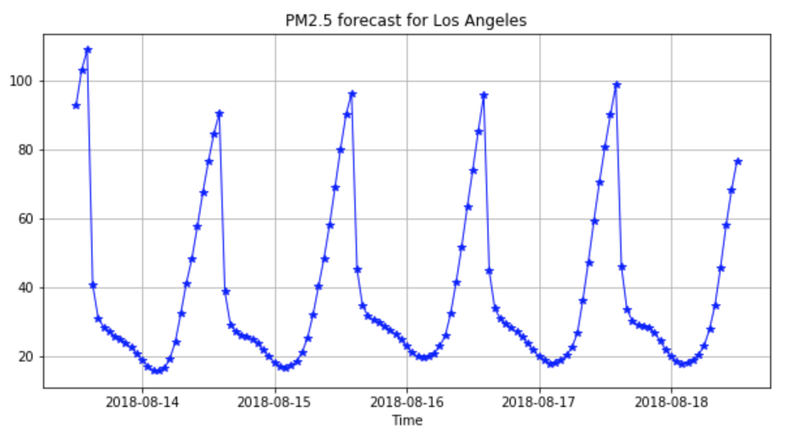 In Los Angeles, the PM2.5 values during the day are mostly within the norm, while the values continue to spike each night. This daily pattern where the air quality is the worst at night is caused by the temperature inversion. As the land gets cooler in the night, the winds become weaker, hence the air pollution and particulate matter are trapped near the ground. 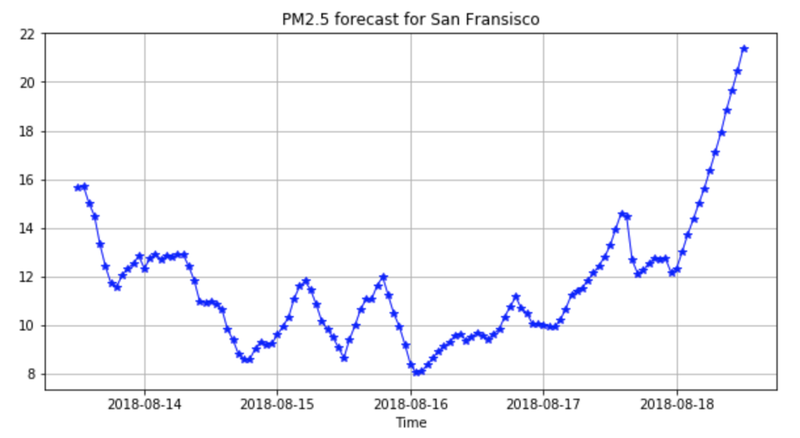 Fortunately for San Fransisco, the air quality is within normal levels from day to night. However, towards the end of the forecast values are rising quite rapidly. PM2.5 levels here are susceptible to changing quickly due to the wind direction and the close proximity of the fires. Analyzing air quality across the United States, and even across cities involves closer examinations at how we can use data to inform ourselves about public health, disaster, and climate phenomenons. Visualizations of the effects of these fires can not only influence our individual actions, but also the broader approaches to preventing fires and improving the air quality as well. With the Planet OS Datahub, there is a repository and access point for obtaining information on a plethora of global and regional phenomenons. With such vast amounts of information comes limitless opportunities for action and education regarding the world around us. We routinely add new datasets to Planet OS. If you’d like to be notified when new data becomes available, follow Planet OS on Medium or subscribe to our email newsletter to receive future updates in your inbox. Thanks to Eneli Toodu, Ilya Khamushkin, and Nishtha Sharma.